We want to know what your guest experience has been at Camp Arcadia. We will post notes on this page periodically. Please send snail-mail or submit your testimonials and memories via this form. “My husband and I thank you most sincerely for a wonderful week at RKD. The program, the Bible study and lectures, the food, the fellowship, the fun were even richer than we expected! And having two of our kids and their families to share it with was an awesome blessing for which we thank you very much! “We arrived at Camp Arcadia for the first time in August 2000 from the hustle of the Chicago suburbs. It didn’t take long to realize that RKD is not a place to have to hustle about! Although meal times are set, there is the overtone of anticipation for Kurt’s culinary delights. No one is late for dinner! Meals are served family style, with everyone seated for prayers at the same time and with extra helpings upon request. Kids’ alternatives are offered for picky little ones, but we found that our kids (ages 8, 6, and 4) were perfectly happy with the delicious meals. And I LOVED IT! A true mom’s vacation… no meal planning, no cooking, and no cleanup! The first day we arrived I was determined to lock our room to keep our vacation money and other valuables safe… We soon adapted to camp ways, and left our room unlocked. I cannot think of too many scenarios where this is possible. “On the way home from our first week at RKD we asked our six and eight year old daughters if they wanted to go back the next year. Their response was immediate and definite…they absolutely wanted to go back as soon as possible. They were disappointed when we said it would be a full year before we were able to return. From that day forward we count the days between trips to RKD! Camp Arcadia is the only vacation we have ever taken where Jean, wife and mother, gets a vacation too. There are no meals to prepare, no rooms to clean, and the kids can be allowed to be on their own in the safe, Christian environment without having to be watched all the time. And yet, they seem to want to do things with Mom and Dad even more at RKD.Now that our children are grown we enjoy Arcadia in some new ways…we see the local sites or sometimes just sit outside, listen to the waves and read. There are many interesting shops to visit or sites to see. “It’s not like a camp where you would stay in a tent or camper, but it’s more like a family vacation spot. It is a Christian place, but that doesn’t make it not fun or boring. It makes it more fun! Everybody there is so incredibly nice, and everybody has such a great time. 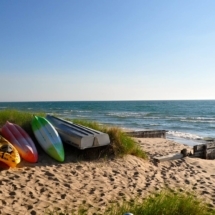 The camp is right up next to [Lake Michigan] and has an awesome beach. The food there is great too. It’s some of the best food I ever had. There is also an awesome soda fountain and snack shop. “I have more memories from Arcadia than I do of anywhere else in the world. I had a surprise birthday party in the Trading Post when I was six with my summer friends. I remember going to kindergarten you group in the Ark. I’ve gone to confirmation camp with about 100 other high school kids, and even got married once! Granted, I was seven and I don’t remember my husband’s name anymore, but still. Every week at camp there is a talent show. Two, actually; one for the campers and one for the staff. Skits and music and more…They never fail to be hysterical. But on top of everything, it is a place for me to grow closer to God.